All Slots Casino was founded in 2000 and is a member of the Jackpot Factory group, which is one of the most respected and trusted casino groups in the industry. 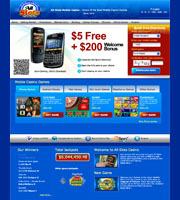 As you can likely judge by their name, ''ASC'' features a wide range of online slots. There are more than 200 games offered, including 3 reel, 5 reel classical and video slot games. You'll also be able to enjoy mobile casino games, such as Blackjack, Baccarat, Roulette, Craps and Keno. Casino also constantly receives various awards from respected industry sources – All Slots Casino has received awards as ''Best Slots Casino'', ''Best Overall Casino'' and many others. All Slots Mobile Casino is also powered by MicroGaming and has been made in a cooperation with a company called ''Spin3''. There's a wide range of games, supporting the most popular platforms – you can play mobile slots using iPhone, Android, iPad, iPod Touch, BlackBerry and just about any other device, which supports Java. Mobile Casino has been created and developed with customer experience in mind. Each game is tailored to fit all platforms offered and to feature easy to understand in-game play. All Slots Casino fits the easy to understand criteria while also featuring a functional interface, with some advanced functions. Two windows on top of devices screen, which will show your cash balance and current bet. Quick navigation buttons – Lobby, Pay Table, Banking and Help. + and - buttons, to adjust bet sizing. ''Coins'' button, to adjust the amount of coins bet per line. ''Lines'' button, to adjust the amount of lines bet. All Slots Mobile Casino has several games on offer for each slot type. Progressive Jackpot Hunters will enjoy games like ''Mega Moolah'' and ''Major Millions'', which offer chances to win 6 and even 7 figures in a single spin. Table game fans will enjoy playing Blackjack, Baccarat, Roulette and Keno. There's also something for those who like to bet on sports – Royal Derby is a horse racing simulator, which is available for play directly from your mobile device! A great thing about All Slots Casino is the amount of platforms supported – each of the games offered are tailored to run on most devices, thus fitting every player type. Whether you are looking for iPhone slots or Android ones, this casino will bring it! Free phone Support – 24/7 phone support, which is free of charge for most countries. Call-Back Service – click on the support button in your mobile device and choose a call-back service. An agent will call you within 10 minutes! This is an amazing feature and certainly one of the best ways to get help. Email Support – if you are not sure about your language skills or just prefer getting help via email, send it to mobilesupport@allslotscasino.com. All queries are answered within 2 hours, which instantly shows how dedicated and serious this company is. There's a relatively wide range of both, deposit and withdrawal methods offered. Minimum deposit amount depends from the method used, but generally is in the range of $10-$50. As for cash-outs, you'll be able to request a withdrawal starting from $50. New players will have to verify their identity and age by making a deposit of at least $10. The details for payment method used will have to be exactly the same, as those registered on your account. Open an account at All Slots Mobile Casino and you'll get 5 Free Credits completely free! Try out mobile slots free of charge, when you open an account! After you've joined there's going to be an SMS sent to your mobile device, which will contain a validation link for your $5 free. For those, who are looking to deposit real money, there's a 200% match bonus, which will award up to 200 credits free, once you've made your first deposit. There's also a 10% cash-back promotion running – you'll get 10% of your monthly deposits back into your account, up to a whooping 450 credits! Loyal slots players get even more rewards! Every time you wager $1 at All Slots Mobile Casino, you'll be awarded with 10 Points. These points can be exchanged to cash at a rate of 1,000 for $10 in cash!